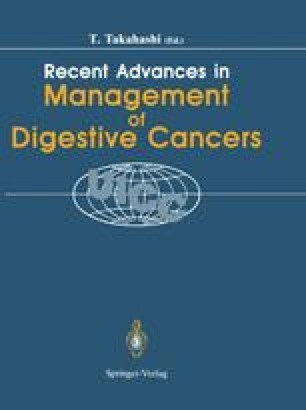 ImmunoChemoSurgery was proved to be effective in preventing cancer recurrence and improving 5 year survival rate of stage III gastric cancer patients. To evaluate the effect of immunochemosurgery, two randomized trials were studied in 1976 and 1981. In first trial, 5-fluorouracil, mitomycin C, and cytosine arabinoside for chemotherapy and OK 432 for immunotherapy were used. The 5 YSR for surgery alone (n=64) and immunochemosurgery (n=73) were 23.4% and 44.6%, respectively, a significant difference. In the second trial, there were three groups: group I, immunochemosurgery (n=159); group II, surgery and chemotherapy (n=77); and group III, surgery alone (n=94). 5-Fluorouracil and mitomycin C for chemotherapy and OK-432 for immunotherapy were administered for 2 years. The 5 YSR of group I was 45.3%, significantly higher than the 29.8% of group II and than the 24.4% of group III. The postoperative DNCB test, T-lymphocyte percentage, PHA and con- A-stimulated lymphoblastogenesis and the ADCC test showed more favorable values in the immunochemosurgery group. Therefore, immunochemosurgery is the best multimodality treatment for advanced gastric cancer.